The San Jose Blog: SJSU Starting Construction on $126M Student Housing Project! 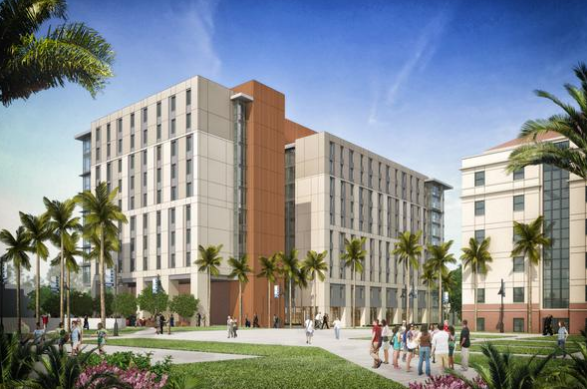 SJSU Starting Construction on $126M Student Housing Project! We're going to have another crane in the air before long and this one will be on the SJSU campus. The University has broken ground on a student housing project with 850 beds. The building will be 10 floors, a bit shy of the 15 floor high-rise a stones-throw away. This project is Phase 2 of the Campus Village project and will cost a cool $126M. Phase 1 was completed in 2005 and added a total of 2,275 beds. As Nathan Donato-Weinstein mentions in the source link below, this will be a major step in moving SJSU from a commuter school to a more urban university. The building should be done by Summer 2016. Great things are happening for downtown San Jose! Little things like the The Alameda renovation, the Whole Foods development, and the redevelopment of Guadalupe Park makes me excited for downtown SJ's future over the next couple of years. San Jose needs to catch up on upgrading downtown San Jose. All of our tax money has always gone to welfare and high tech companies. Now, there abandoned with no lease due to expensive square feet. Where has our money gone? We need to invest in something our locals can enjoy! to have pride and know our roots of a world class city. Outsiders come and use all this high tech payed by us. San Joseans need more of this. A financial district. Educating our citizens. This is one way to beat crime! That(upgrading downtown) was done in the 80's. Considering the amount of unused land San Jose has, especially downtown, I think San Jose is heading in the right direction. Look around, there are great projects going on. We just have to maximize on the opportunities so San Jose can become a vibrant walking city which I'm seeing more and more of everyday.